(1920- ) "Edna Miller grew up in New York City near The American Museum of Natural History where the animal exhibits always interested her. 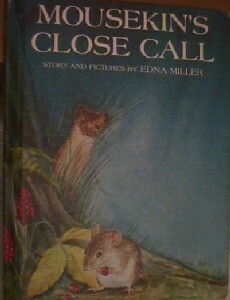 During her travels in this country and abroad, Mrs. Miller has observed the behavior and habits of animal life. After completing Mousekin's Christmas Eve, Mrs. Miller felt there was only one reward she could give the live mouse she was using as her model. He had been well fed and exercised, but a wire cage was no place for a healthy mouse. She 'carried the cage to the woods and opened the door-- to freedom.'" 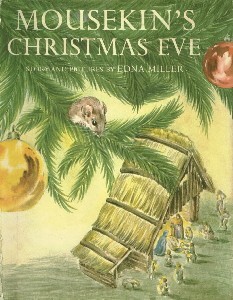 --from the dustjacket of Mousekins's Christmas Eve. After studying design and illustration in this country and abroad, she settled in North Hero, Vermont. I've also found reference to a 1969 filmstrip of Mousekin's Golden House. 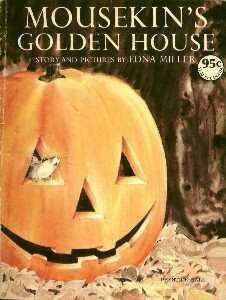 Mousekin's Golden House was Miller's first foray into children's books, and it was a smash success, still fondly remembered by many now-grown-ups. Fourteen further adventures of Mousekin were published in the subsequent 26 years, all featuring the beautiful watercolors of this natural history enthusiast. Mousekin Finds a Friend. Prentice-Hall, 1967. Mousekin Takes a Trip. Prentice-Hall, 1976. Mousekin's Christmas Eve. Prentice-Hall, 1965. Mousekin's Close Call. Prentice-Hall, 1978. Mousekin's Easter Basket. Prentice-Hall, 1986. Mousekin's Frosty Friend. Simon and Schuster, 1990. Mousekin's Golden House. Simon and Schuster, 1964. Mousekin's Lost Woodland. Simon & Schuster, 1992. Mousekin's Thanksgiving. Simon and Schuster, 1985. Mousekin's Woodland Birthday. Prentice-Hall, 1974. 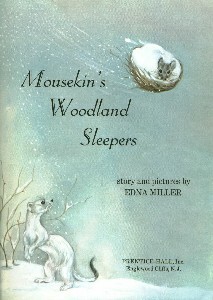 Mousekin's Woodland Sleepers. Prentice-Hall, 1970. Patches Finds a New Home. Simon & Schuster, 1988. Pebbles, a Pack Rat. Prentice-Hall, 1976. Pícaro, a Pet Otter. 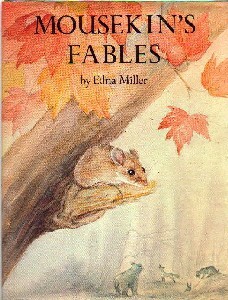 by Dorothy Wisbeski and illustrated by Edna Miller. Hawthorn Books, 1971. Scamper: a Gray Tree Squirrel. Pippin Press, 1991.